The top three already have big league experience. Minor started eight games for the Braves last season, completing 40 innings while striking out 43 and walking 11. The former Vanderbilt attendee figures to start the season in the rotation and while he’s unlikely to replicate his 2010 numbers, he’s better than most fifth starters. Hellickson impressed as well, with a similar strikeout and walk rate. Although he’s hampered with a hamstring injury now, if healthy, the Des Moines native will open the season as the Rays’ fifth starter. Drabek’s entrance to the majors did not fare as well, but he’s a top prospect for a reason and could open the season in the Jays’ rotation too. Archer is one of the jewels the Rays received in return for Matt Garza, he should open the season in Triple-A, but a big league stint near season’s end -perhaps in the bullpen–is not out of the question. Banuelos received hype for a recent appearance, but he’s just now turning 20 and it’s unlikely he’ll get much more than a cup of coffee this season. Britton, on the other hand, should debut this season, as he spent last season in the high minors and pitched fairly well, with sub-3 ERAs at both Double- and Triple-A and peripherals to match. As for the rest, Gibson shot through the system and stands the best chance of appearing in the bigs this season. That doesn’t mean you should ignore arms like Lamb and Kelly in keeper leagues, though, as again, they have the pedigree for a reason. Just don’t get too infatuated with these guys, as pitching prospects are more volatile than hitting prospects. Jeremy Hellickson: The Next David Price or Wade Davis? The Rays, as seems to a yearly tradition, have a bright young pitching prospect hitting their rotation this year. Jeremy Hellickson comes off a stellar, if short, debut, already has a scintillating nickname in “Hellboy.” But we’ve seen this story before, and with varying results. How does Hellickson stack up against fellow young Rays David Price, Wade Davis and Jeff Niemann? Take a look at the table below for a quick overview of the relevant statistics these young Rays accrued in the minor leagues and in their respective debuts. The percentage of games started is included because players always perform better in short stints out of the bullpen. Some differences immediately step to the fore. Not all debuts were created equal. We can probably eliminate the chance that Hellickson ends up like Niemann based on a few factors, including his debut. Not only did Niemann show the worst control of the group in the minor leagues, but his strikeout rate dropped as he advanced through the minor leagues, eventually bottoming out in his debut. But eliminating Niemann still leaves the possibility that Hellickson ends up more Wade Davis than David Price. Now, these pitchers are all different, and have varying arsenals, ages, and histories, but they all have the common misfortune of having to face the AL East from the get-go. David Price obviously did well, and Hellickson’s numbers compare favorably to Price’s. If only Hellickson used his left hand, we’d have a nice comparable player to point to. Why won’t Hellckson end up like fellow right-hander Wade Davis? Control is the easiest answer. Hellickson’s is elite, Davis’ average or below. Another answer lies in their comparative arsenals. Davis relied mostly on a fastball, while Hellickson has a plus-plus changeup and a solid curveball to go with his 91 MPH fastball. Bloomberg Sports has him putting up a 3.89 ERA and 1.24 WHIP, and he obviously has the upside to better that. Given his elite control, strong off-speed arsenal, and historical record so far, Jeremy Hellickson is on track to be more David Price than Wade Davis. Expect a strong year from Hellboy, even if he hits a few bumps along the way. Jeremy Hellickson may have been an effective major league starter had he cracked the Tampa Bay Rays’ roster on Opening Day of this season. But where an April gig would have been a luxury, Hellickson’s promotion recently became a necessity. The Rays had a plan for Hellickson. He made a spot start last week and was sent back down to Durham where his workload could be monitored and controlled. Once the rosters expanded in September, they would recall Hellickson and use him out of the bullpen. Tampa Bay was able to execute the first part of the plan. Hellickson made his major league debut – a successful one – and was immediately returned to Triple-A. However, even the best-laid plans are subject to change. With Wade Davis AND Jeff Niemann experiencing shoulder pain, the Rays had no choice but to bring back Hellickson and use him as a starter, beginning with tonight’s outing against the Detroit Tigers. Although he is listed at 6-1 – already on the short side for a right-handed starting pitcher – that might be a generous measurement. Still, the numbers don’t lie. In 578.2 career innings in the minors, he posted 630 strikeouts and just 135 walks. His pinpoint command of the strike zone has drawn comparisons to Greg Maddux. Stuff-wise, Hellickson sets hitters up with his low-to-mid-90s fastball, and puts them away with an excellent change-up and plus breaking ball. This time around, Hellickson will be on the shortest of leashes. After pitching 114 innings last season, he has surpassed 124 innings this year (117 minor league, 7 major league). Hellickson pitched a career-high 152 innings in 2008. Don’t expect him to go much beyond that this year, if at all. If that is the case, then we might be looking at five-to-seven big league starts, or possibly just a couple of starts and several relief appearances, if Davis and Niemann get well soon. 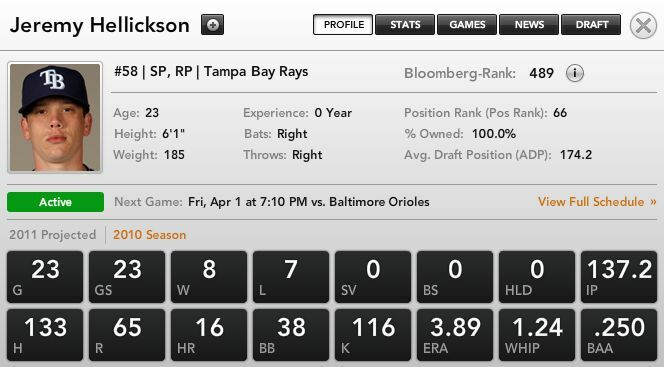 Still, given Hellickson’s talent and body of work, he’s worth an immediate pickup in all leagues. your fantasy league, check out Bloomberg Sports’ fantasy kits.